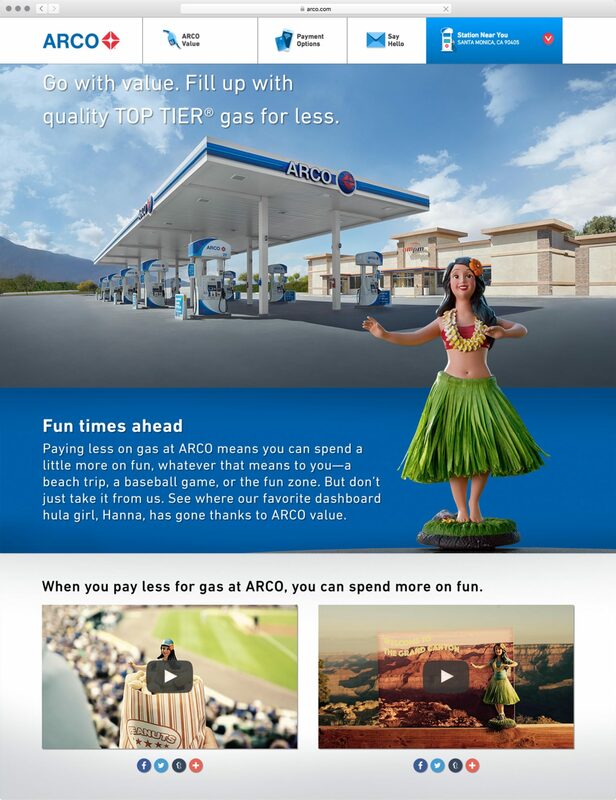 Arco recently launched a campaign with Hanna the Dashboard Hula Girl. As per the treatment, she needed to be fun, innocent and have a slight vintage feel. I was tasked out to design Hanna and her various outfits as she travels around the USA. Legacy Effects 3D printed my design, and rigged her to be a functioning hula bobble. Great job! I’ve never looked up a commercial character before now. Damn, good job! Glad you like Hanna! It was a fun one. Thanks for the kind words. It’s a terrific campaign. Who does Hannah’s voice? Glad you like the campaign. I’m not sure who the voice actor is. I was just involved on the front end, so I was out of the loop during the post production. It sounds like Judy Greer, to me…? 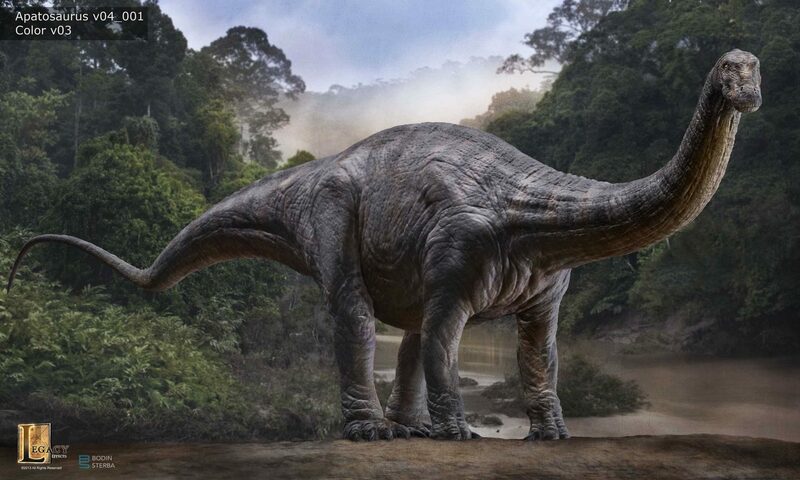 will replica hannas be produced for sale? my husband loves her! Glad he’s a fan. I don’t know of any plans to make Hanna into a real hula bobble. I hope they do! baseball Hannah, would make a great marketing deal, maybe for a ballpark giveaway and sale at ARCO stations. I am sure the creator would love that idea, for cash flow with variants in each team’s colors and logos. Is Arco going to be selling any of the Hanna the dashboard hula girl? She is so cute! I would love to have one like her. I’m glad you are a Hanna Fan. I don’t know of any plans to make Hanna into a real hula bobble. I hope they do! I would buy the hula girl, and so would my friends. If you guy’s don’t make it for sale , someone will. I’d rather have the real thing. I have a 1959 Vw bus . I would love to put her on my dash . Are they for sale ?? We love Hanna the Hula Girl. You definitely have created something special. I agree the baseball Hanna with each of the MLB teams logos would be a cool promo. I’d buy one. Great job the the marketing team at ARCO as well for their efforts. I thought it was so cute I am going to use a similar looking one as sort of an ” elf on the shelf ” in pictures of my grandchildren on vacation this summer Kudos to Arco a great ad. Hana is a fantastic campaign. Nicely done! Hope it leads to many more cool projects for you and your agency. Who is the gas customer? It looks like Nomar Garciaparra, ex RedSox-Dodger player. We see the commercial and Nomar a lot during the games broadcasts. I am so interested in buying all the Hanna Hula girls. I have looked everywhere and have not found one to purchase? Are you selling them? If not, you should. Love the many different outfits Hannah wears and would love to start a collection whenever the powers that be decide to have the doll manufactured! Arco is the only gas I buy! We love Hannah the Hula Girl at our house, too. Proof that cute coomercials, that aren’t annoying can be made! I hope they reproduce and sell these. My husband would get a kick out of it. Good job! Any chance of one day being able to purchase any of the Hanna bobbleheads? Yeah! I want Hanna or ten. MAKE ‘EM! I Love the Hanna hula girl and the whole vintage look . Wish Arco would sell them or you would. I would buy them all. I wish more of the different commercials were being shown on TV. I too would love a Hanna the Hula Girl doll for my van. 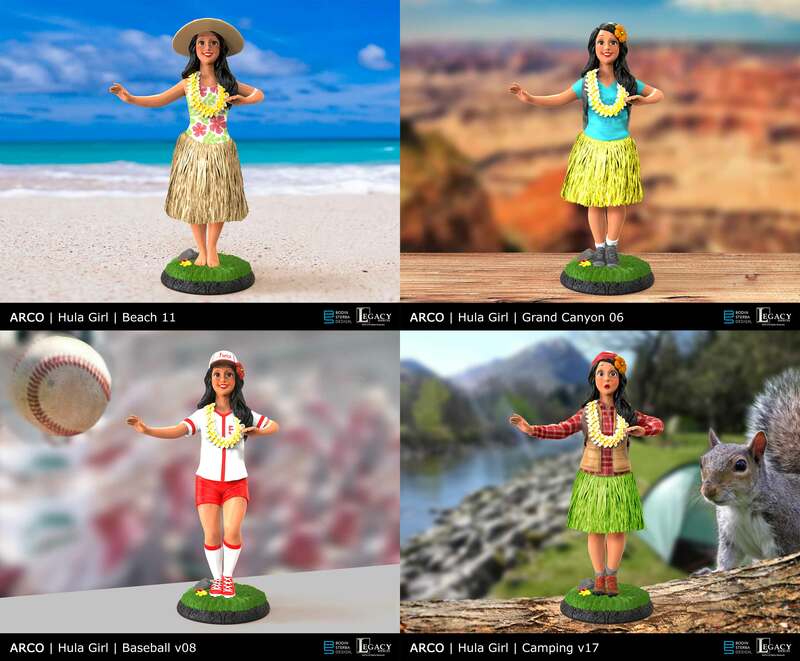 I may have to settle for a hula girl from eBay while Arco decides to make one like Hanna. Of all the commercials I’ve seen in my 62 years I enjoy yours the most of all . It’s wholesome and funny. It makes a good impression on people of all ages which in turn makes people remember Arco Gas. Let’s see more of Hanna in the future. Maybe fishing, skiing or even back to school. So I’m wanting one and from what I’m reading shes not a real dashboard fixture yet. Is that true? Its a great product. I want her with a Dodger Hat on. I’m looking to buy one, now. Correct, she is not for sale. She was made for the commercial series. Sorry! 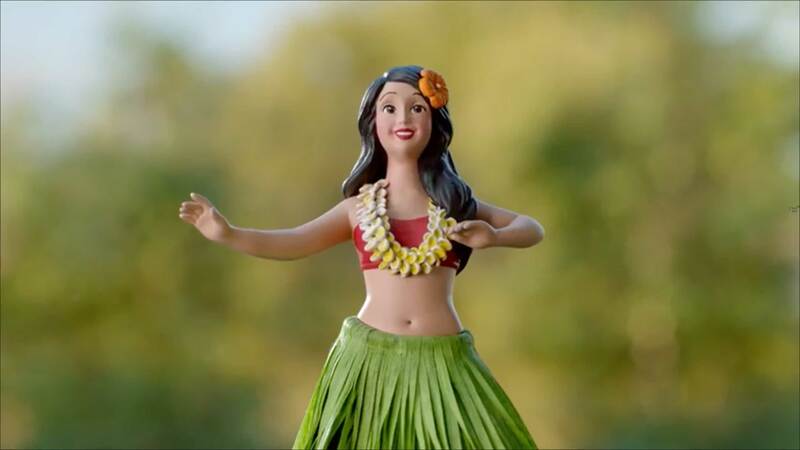 I really, really want a Hannah Hula girl for my car, or desk at work . PLEASE make them for sale! PLEASE! I’m glad you are a Hannah fan! Unfortunately these are not for sale. She was made just for the commercials. I want a Hollywood Hanna! Make these things Bodin!!! Take our money!!! Here!! Have it!! !